As we are all gearing up for the holiday season the last challenge for December at SDC 176 is Kim's "Anything goes." You have the opportunity to enter this challenge up to five times! That's 5x the chance to win a $30.00 gift voucher for Stampotique. I have repurposed a Starbucks Via folder to create a pouch for a coffee gift card. Here is Magda's "Agatha's Christmas" featured on the outside of the folder. France's stars from her design cube are layered over a textured background. 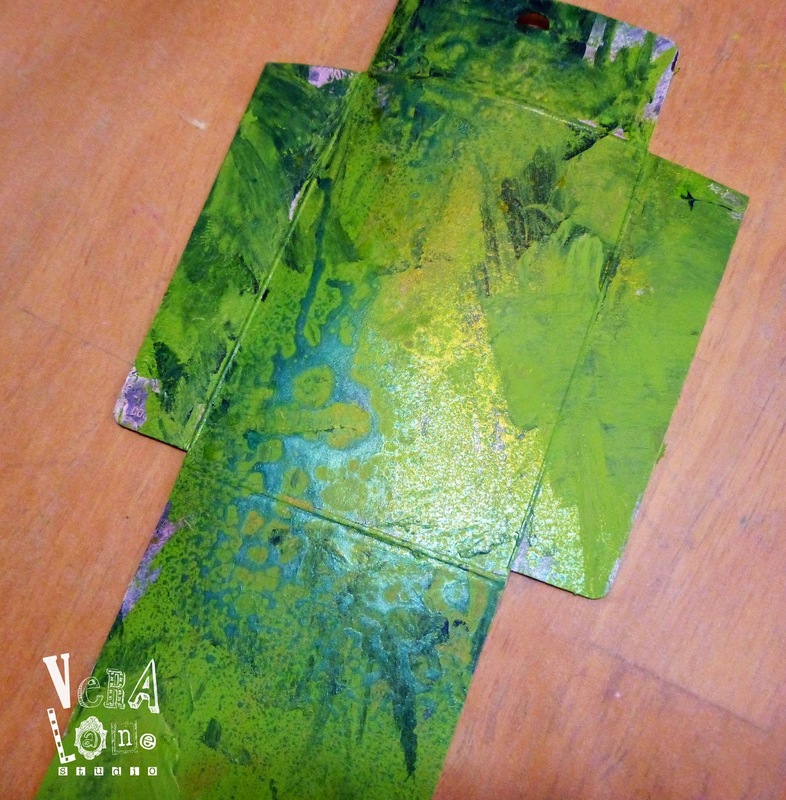 Flatten out the folder and gesso. 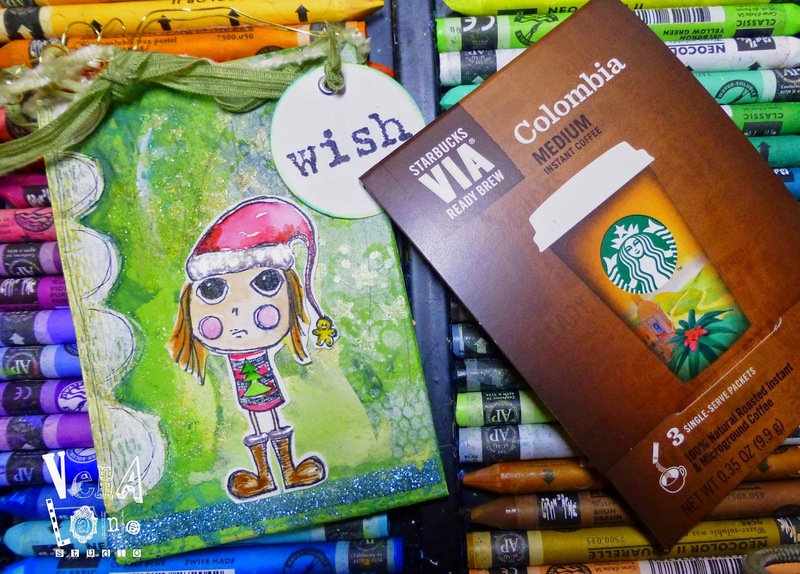 Add layers of acrylic with an old gift card by scraping in all directions. A spray of glimmer mist is added. Double stick tape allows for a strip of glitter for Agatha to stand on. Amy's "wish" is stamped on a cut circle and attached with fibers. I've been burning the candle at both ends but I will say that I am done inking new stamp images (for now) in addition to taking on new art students. Love staying busy! I enjoy making my fun and funky backgrounds but when you are in a crunch there is nothing wrong with reaching for scrap paper for a quick card. This certainly is not one of my better efforts but I loved chopping off Pepper to supervise little Skullboy and Frankie on their Trick or Treating adventures. Vera Lane Studio has just released two new sets from the Cherry Street Collection. Meet "The Crazy Cat Lady" and "iYoga." Both sets come with five digi files in 300 dpi resolution. They can be resized and flipped in MS Word for your to print, color, cut and add to your paper projects. Size small for an ATC or larger for an art journal page. 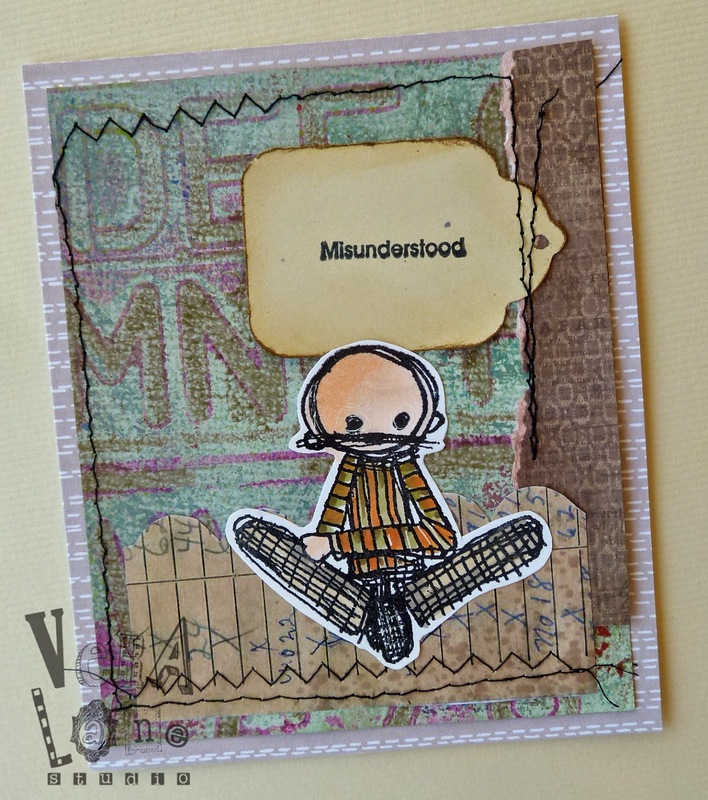 Today's sample is for the masculine theme at the Stampotique Designer's Challenge 167 ordered up by Kim. I used Daniel's "Bob's in time out" and "Misunderstood" from Carol's Collection. 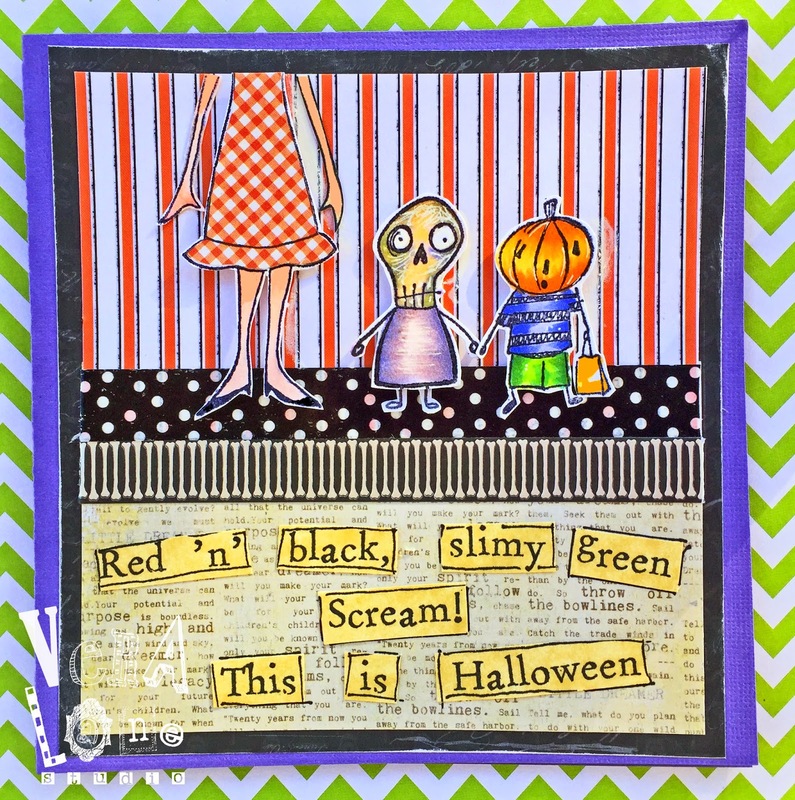 The Stampotique Designer's Challenge (SDC 166; Get Your Spook On) this week is calling for entries with an "Early Halloween" theme. There are some exciting and wonderful projects the team has created for Carol's challenge. 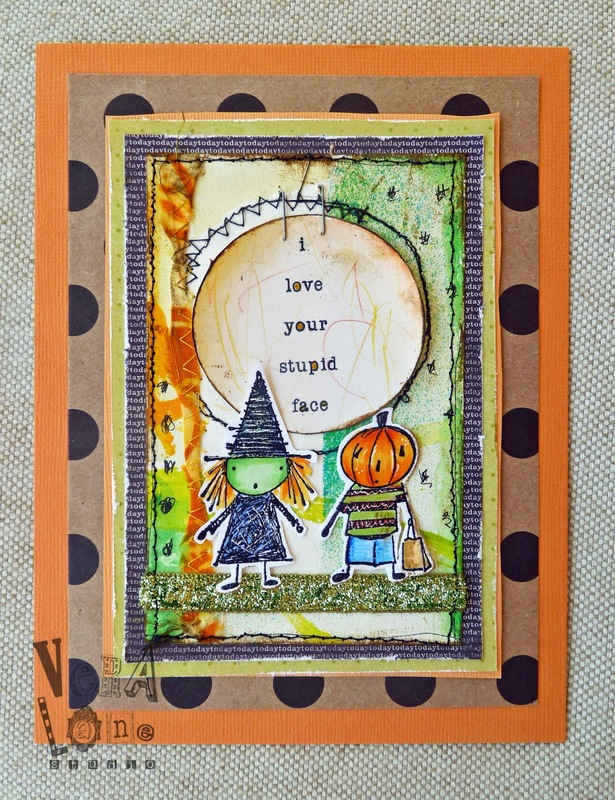 My little collage and stamped card was inspired from a funny sentiment I saw in a card shop in Ann Arbor. My little characters are two of my sketchy kid-art inspired Halloween kids - Corie the little witch and Frankie, the pumpkin head boy. Altered playing card challenge week 4. Claudine heads the challenge and we are into week four. With 52 small pieces of art to create it will not take long to catch up or just start with this week. This is really a "no excuses" challenge as the canvas size is so small. 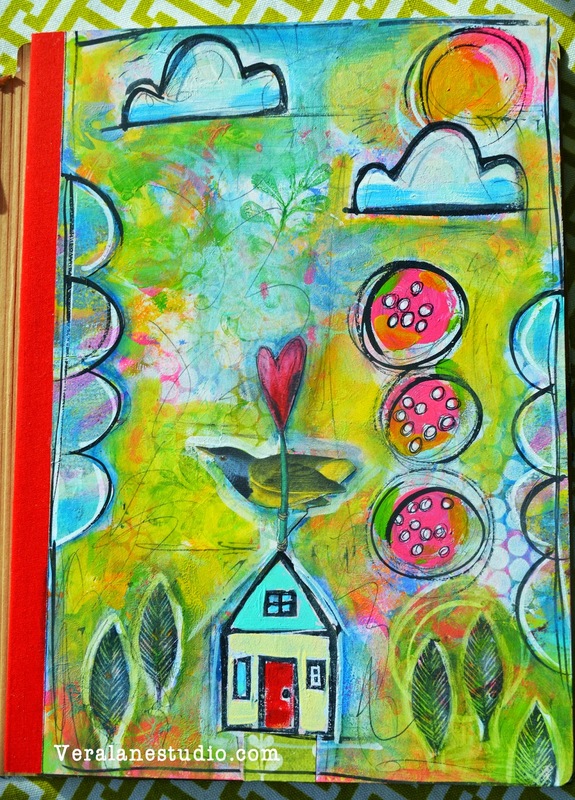 "Small homes grow tight families" is a collage with hand drawn elements. The cloud is the waste paper from my "2 nuage" stamp that Claudine used in the challenge. I decided just to add type with my sun by painting watercolor on an old book page. A PITT XS pen is used for added doodles. 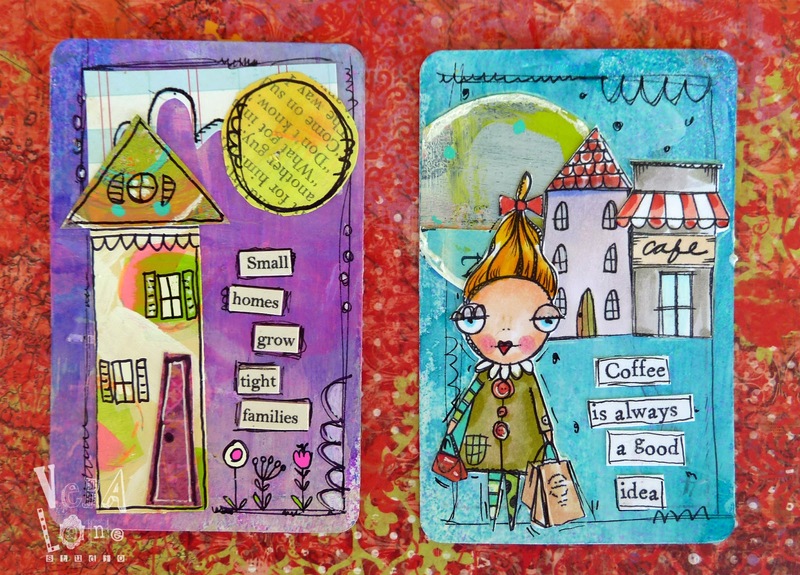 "Coffee is always a good idea" uses Vera Lane Studio's "City Girl" with two of the four buildings included in the set. After a day of shopping who doesn't want to duck into a little café for a cup of joe. 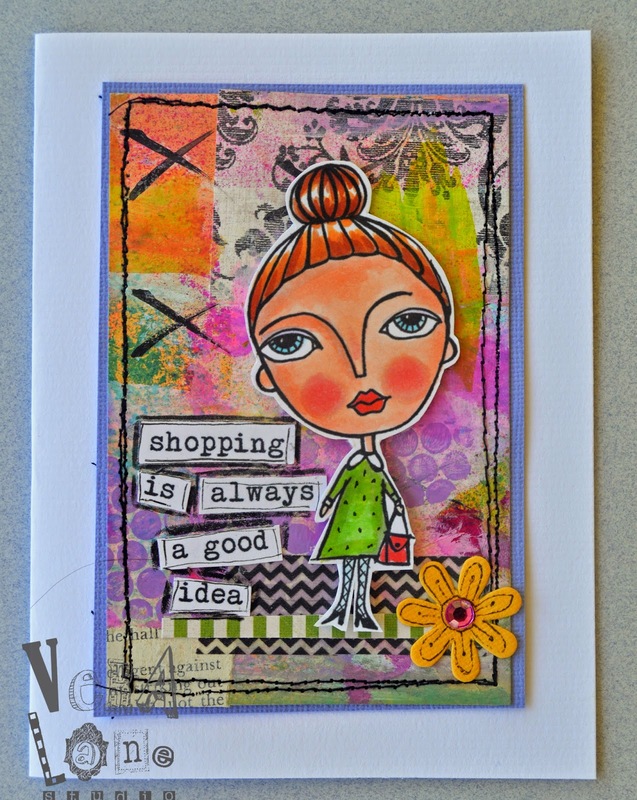 Vera Lane Studio's "Cherry Street Collection" introduces the digi stamp set Glitter and Pearls. The Cherry Street collection features diverse characters from the original Vera Lane Studio crew. The blue header background identifies images in this line. These digi characters still offer an element of whimsy with a fresh style all their own. Glitter and Pearls comes with "Beatrice", two quotes and an optional crown. The versatile set can be used for birthdays, Sweet 16, invites, Valentine's Day, or any time you need to send a little glitter. 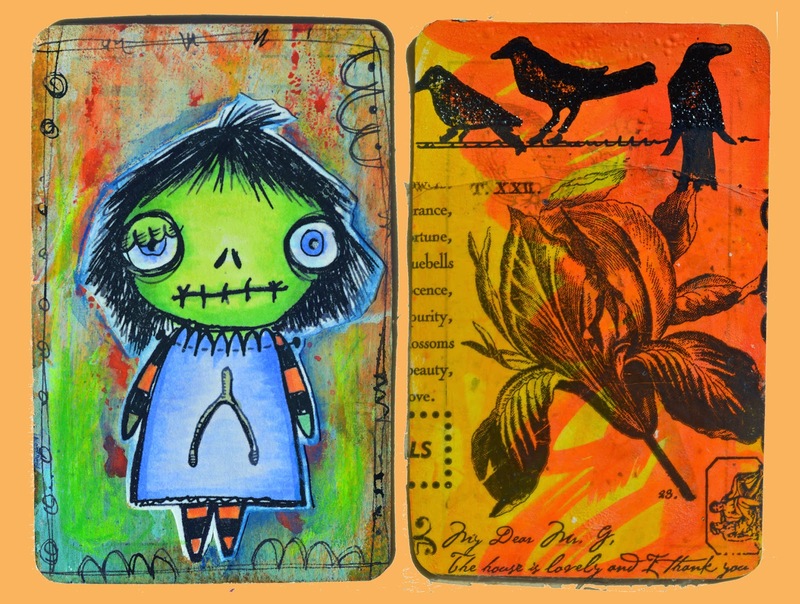 Beatrice can be enlarged to create a mixed media canvas or reduced to create an ATC. Her clean lines and open spaces makes for easy coloring and or paper piecing techniques. 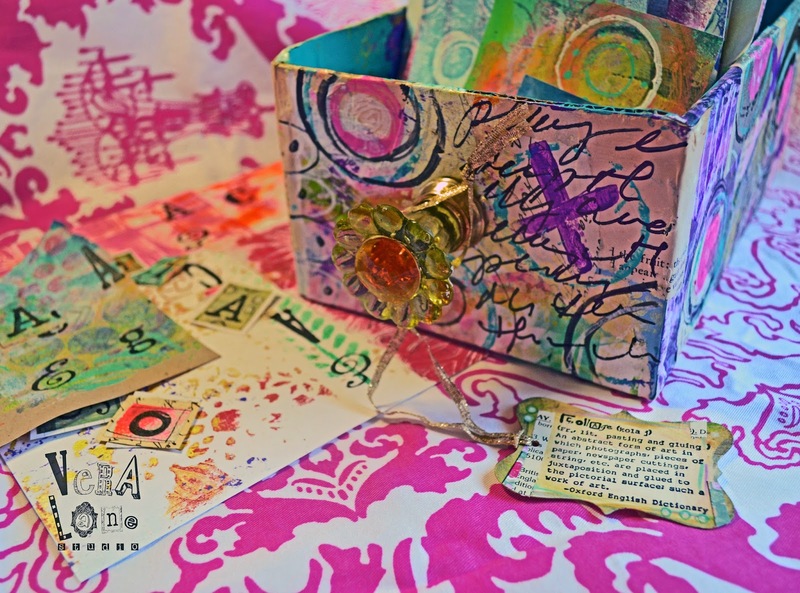 Vera Lane Studio images are available for instant download. All VLS digi stamps come to you in 300 dpi resolution .png files. They are designed with the end user in mind to craft into your personal paper creations. See Glitter and Pearls and the complete selection at the Vera Lane Studio Shop. 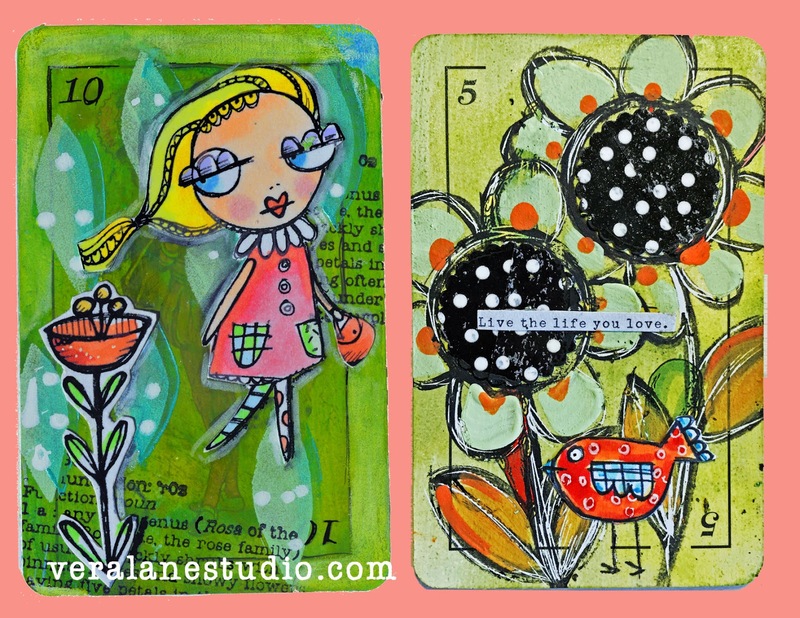 This is week 3 of Claudine's Altered Playing Card Challenge. If you have not jumped on board, now is a time to start. 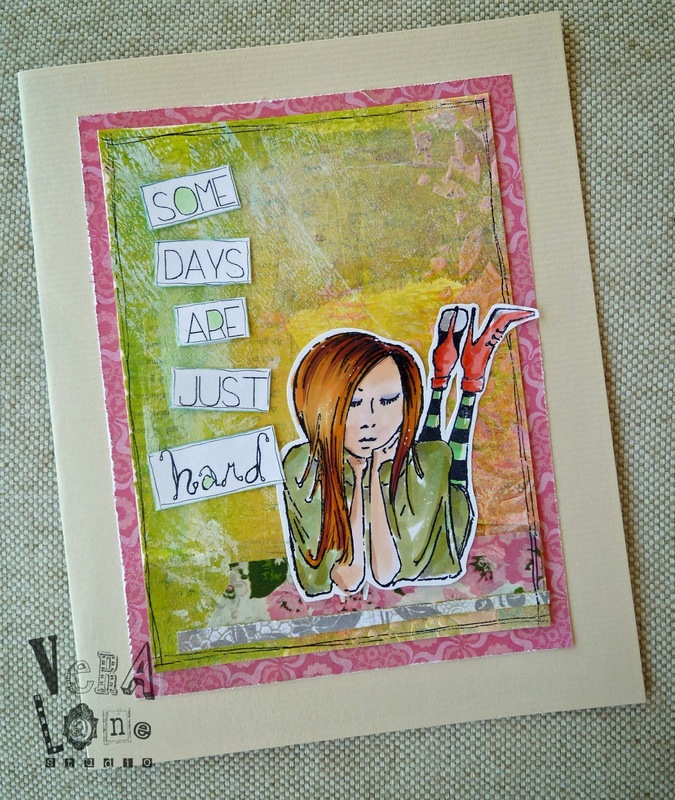 My goal is to respond to the challenges with a digi stamp and a rubber stamp each week. 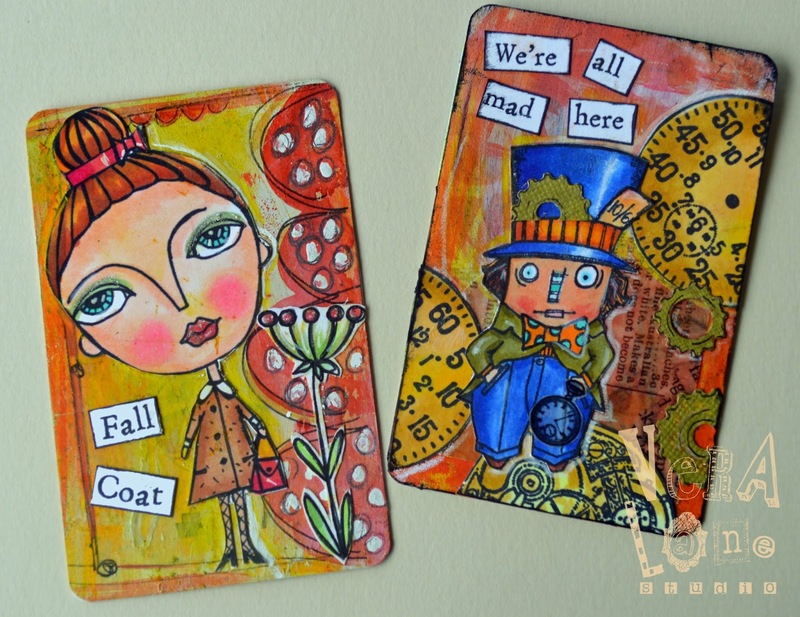 Claudine used alcohol inks and Tim Holtz's Distress Ink for her backgrounds using a fall and a Steampunk theme. For "Fall Coat" I used mustard seed and spiced marmalade Distress Inks over gesso. The digi images are from the Cherry Street Collection in my Vera Lane Studio Etsy shop, Classy and Fabulous. She is colored with Copic markers. I used BIC white out pen for white embellishments. The background of the second card has the same color distress inks. My number stencil does not show in the picture, but I also used brushed corduroy. I'm not much of a Steampunk fan so putting this together took some thought. I had an old watch cube from Post-modern Design that I had never used from years ago -- out it came. The Mad Hatter is part of my Alice in Wonderland series for Stampotique. I didn't have any gears so I cut circles and used a stamp edge scissor to make the grooves and colored with metallic marker. I used white Prismalcolor to accent my design elements. I love this challenge -- for my time commitment the size of the art is just perfect. Its a great way to try new techniques, push the envelope and experiment. Sam over at the Stampotique Designers Challenge is requesting we use just one stamp. Jo Capper-Sandon's "Jasmine" is such a lovely stamp, it really doesn't need anything else. I stamped Jasmine with Staz-On in jet black and used clear embossing powder. She is colored with Copics. 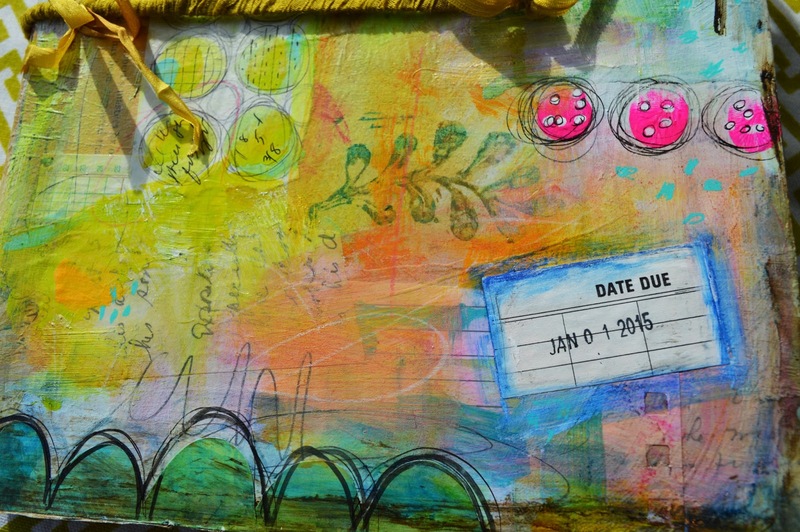 The background is a combination of paint stains and inks over a gesso using an old credit card. Jasmine leans on a piece of floral washi tape, anchored with a strip of patterned paper. 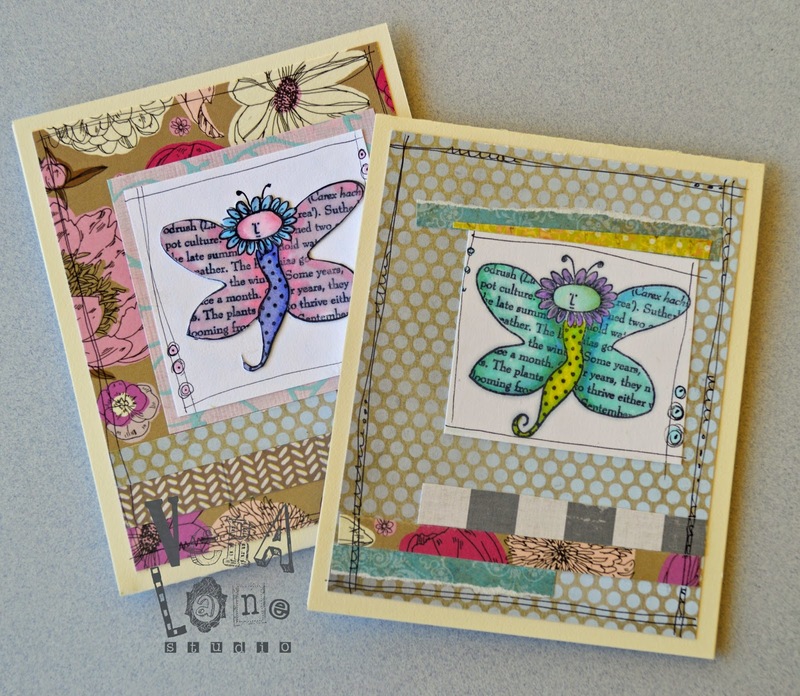 Tomorrow I will be posting two altered playing cards for Claudine's Altered Playing Card challenge. So check her challenge out and come back tomorrow. 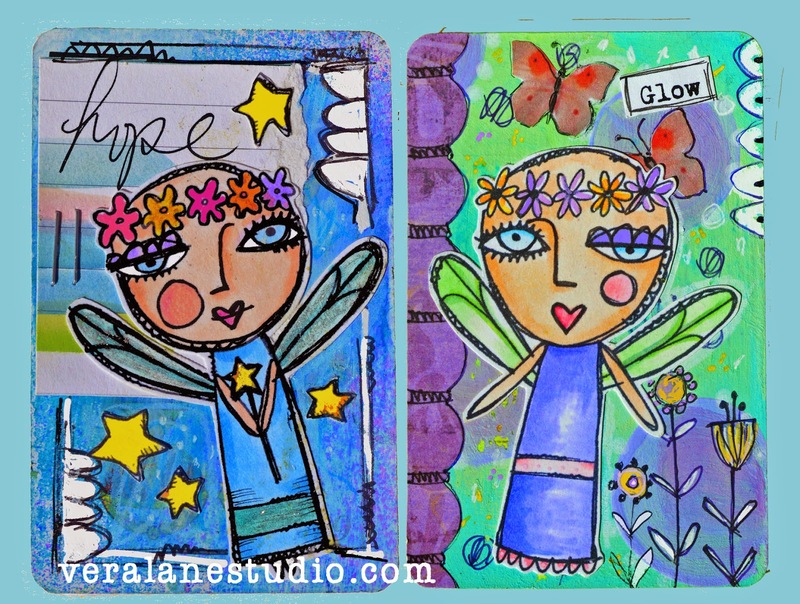 Two new image sets are active in the Vera Lane Studio Etsy shop! "The Love Boat" is a whimsy four image set that can be used for anniversaries, weddings, engagements, invites etc. 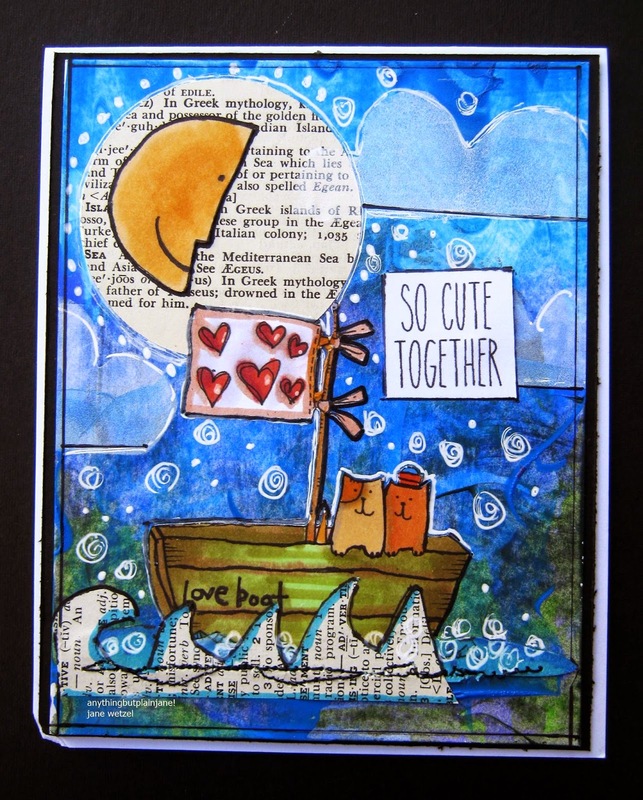 It features two little cats (one with sailor hat) in their love boat with moon man and two sentiments. 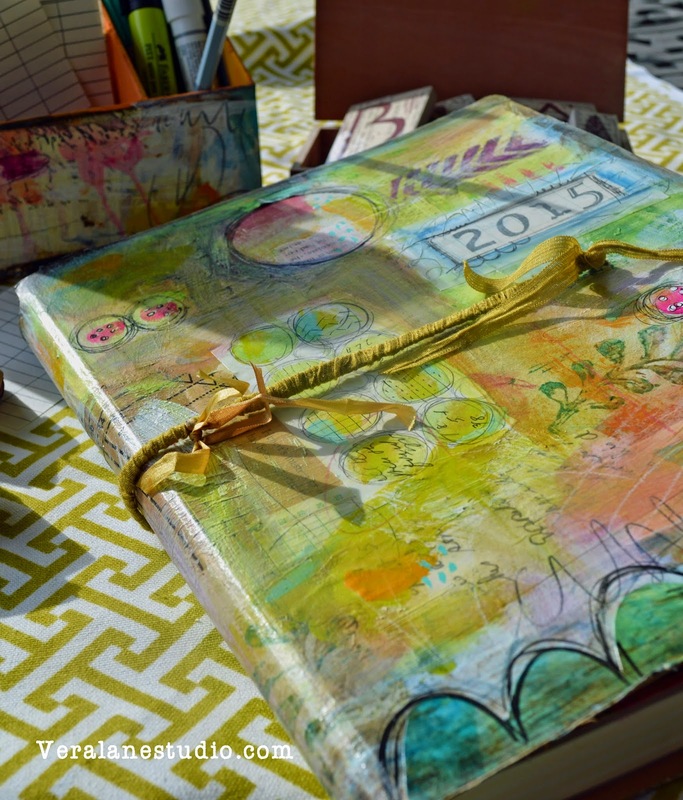 Scroll down and see what the talented Jane Wetzel created with this set! Then there is "Classy and Fabulous" from my new "Cherry Street Collection." I think of this new collection as the "Real Housewives" of Vera Lane. Olive is standing with her handbag with three optional sketchy florals to pop into her scene. " A girl should always be Classy and Fabulous" quote is included. Print out the sentiments from all your sets and make up new phrases. Always endless possibilities with Vera Lane Studio sets. Special thanks to Jane Wetzel for creating the fabulous sample for the "Love Boat" set. I hope the new image sets give you a smile. I've been working on a normal sleeping pattern. It's so hard to turn off my brain at night. Kira Nichols' sick kitty reminds me how I feel when the clock reports it's not yet time to wake up! 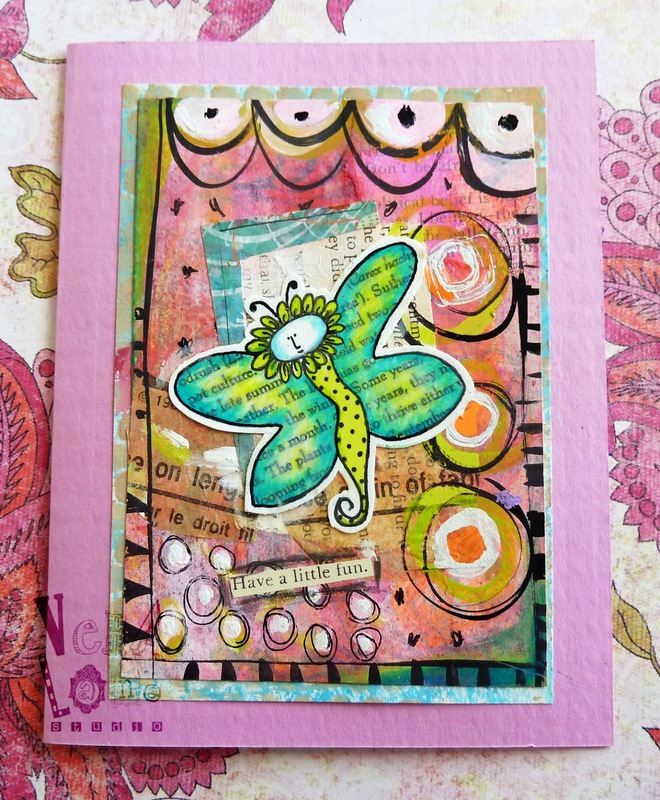 This week's Stampotique designer's challenge calls to use an animal or bird. It was hard to select one from Stampotique's great assortment. As soon as I picked up "sick kitty" I knew I had to create a paper pieced bed for him. It was a little tedious (especially his tiny pillow) but I really got a kick out of making the bed with assorted patterns. The background is acrylic on gesso with newspaper transfer. I thought is was a perfect backdrop for sick kitty to be floating into yet another sleepless night. Claudine Criner is sponsoring the Altered Playing Card Challenge. This is the second week of the challenge, last week prepping 52 playing cards with gesso or sanding. You can also find the group on the FaceBook site. If you are daunted by prepping 52 cards at once gesso doesn't take long to dry, so you can make them week to week. For my first card I kept with the theme and colors. 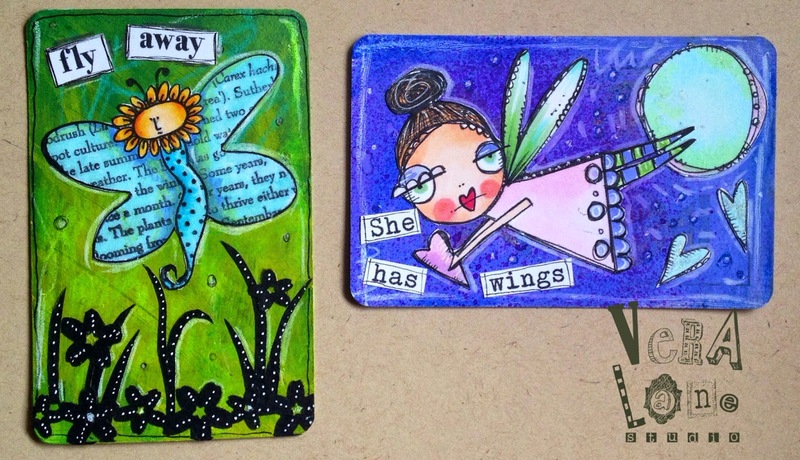 I used my Stampotique's large Fleur Fly rubber stamp and had to improvise the black border. My card was treated with clear gesso and lightly sanded. I applied Inktense for my color. I added a little scribble with Prismacolor pencils. My second card followed Claudine's lead, however I used Inktense again for my color. I also used the Vera Lane Studio digi image set February's Moon and colored the images with Copics. I added Stardust and white Gelly pen accents along with white Prismacolor pencil. 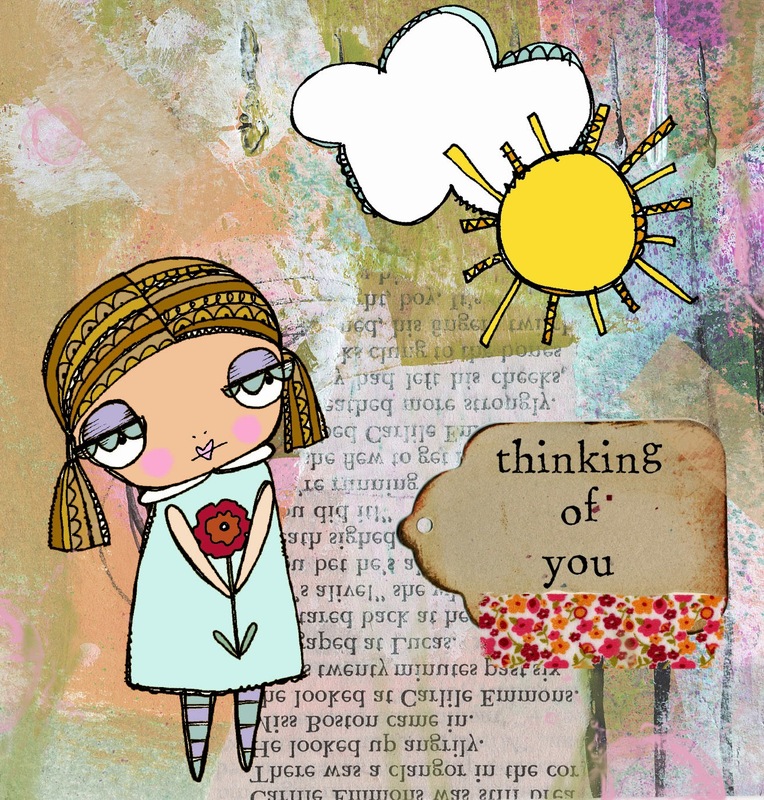 When I created by digi layout in a Word Document I filled my page with numerous images and sentiments prior to printing. If you are new to digi stamps I have started a couple of videos that may help as well as info on my previous post. I am sizing my main digi image to 2.75" - 2.8" to utilize my card space. 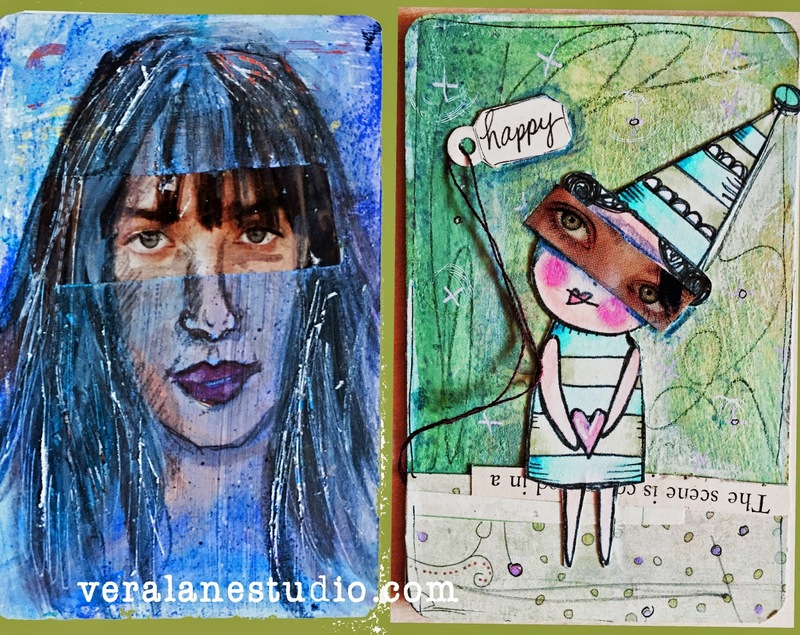 I applied my gesso on the front of my cards to get a variation of images in under layers. Since the back of my cards are not all clean I am finishing the backs by laminating scrapbook paper. Claudine is giving a weekly challenge and demonstrates techniques for two cards at a time. Follow the link and play along -- the art is tiny-- you can do it! 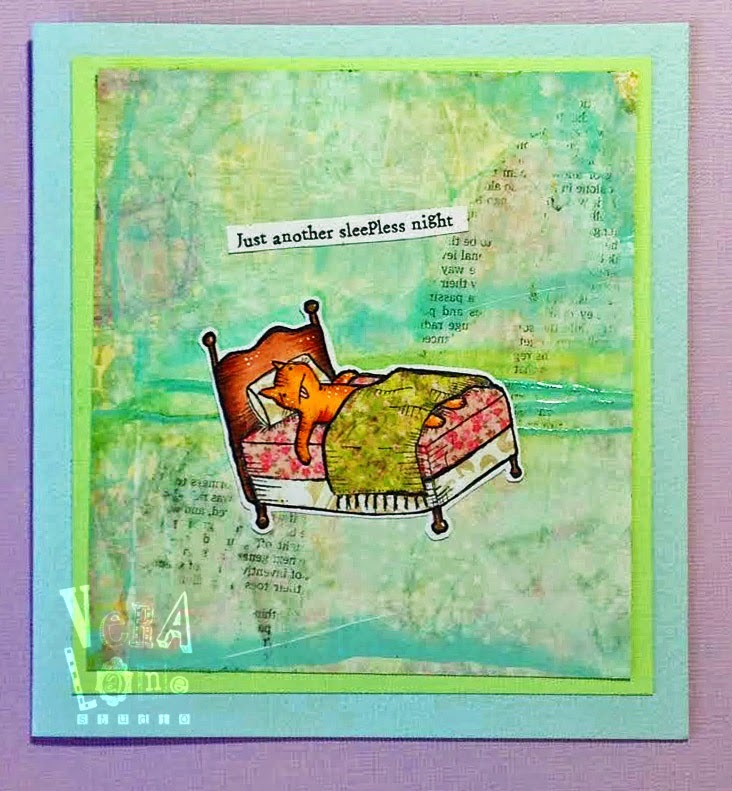 In this YouTube video, Vera Lane Studio shows you how to create a page layout of your favorite digi stamps to get ready to print and color. You will learn to insert your stamps, resize, rotate and flip. The page can be printed and is ready for you to cut, arrange and insert into your composition. This video shows you how to fill a page with multiple images to take advantage of paper economy. It does not address specific card layouts. I recommend using a 100 - 110 lb weight card stock for printing. I love rubber stamps. I've been designing rubber stamp images for about thirteen years. But not every image I make can go into rubber. So I design for the digital stamper too. As a rubber stamp designer I understand media used and how artists like to color their images. I take this into consideration when I create my sets of digi images. Vera Lane Studio images always offers a variety of options in each set. So WHY digi stamps? And what is the deal about them? Digi stamps are designed by artists specifically for the purpose of paper crafting as you would with rubber stamps. 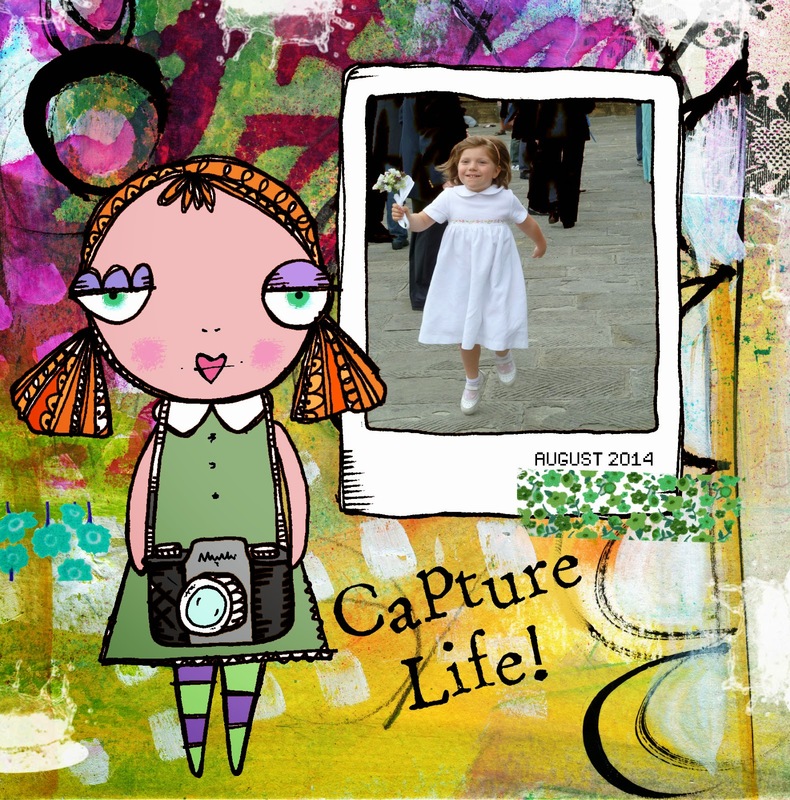 Unlike "clip art" digi stamps are made to design with. They come to you in a high resolution file to allow resizing and printing. The small license fee allows the end user to use again and again for personal use. While they can not use the dye and pigment inks and certain techniques as rubber stamps, they do have many desirable advantages. Colors can be altered even in Word -- no fancy program needed! Save money and storage -- you can have hundreds of images concealed on your computer drive! A great addition to your rubber stamp collection as "make up stamps"
Instant download -- instant gratification! Thank you for taking a look at my posting. 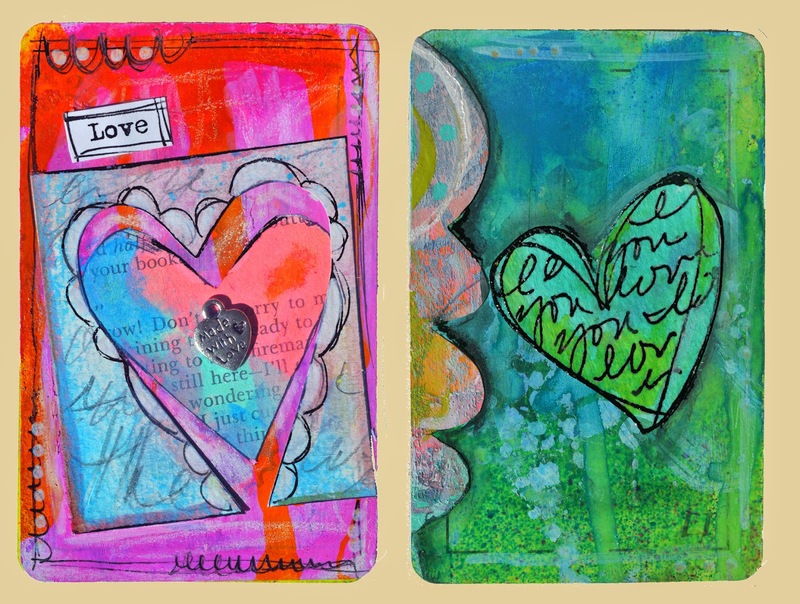 If you have jumped on board to Claudine's Altered Playing Card Challenge I am offering a 20% discount in my Etsy shop. Discount is good through September 14, 2014. 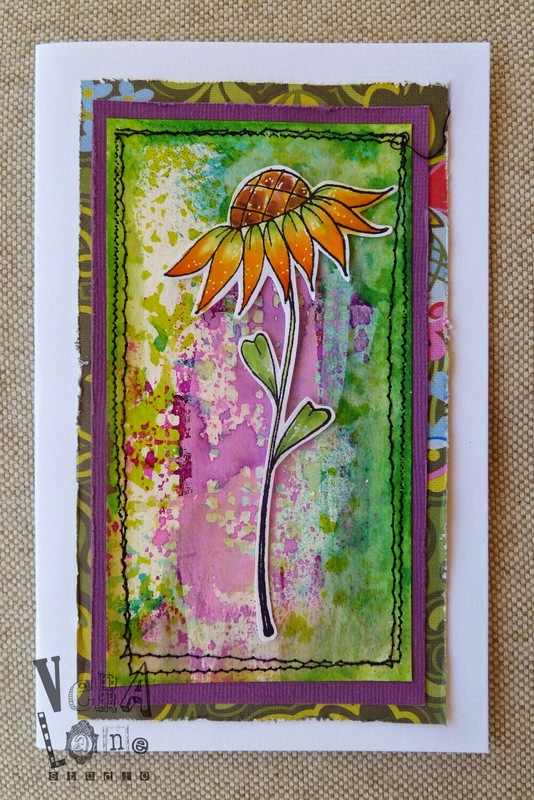 The Stampotique Designer's Challenge (SDC 163) is calling up the use of an older stamp and give it new life. Large Fleurfly is most definitely a blast from the past. 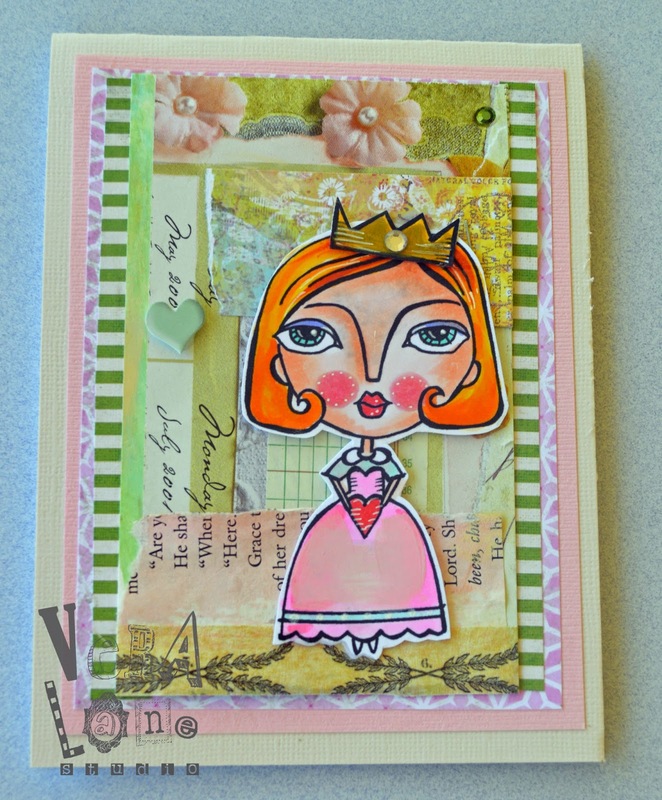 She's part of the Fleur de Girl collection, my original line for Stampotique. I found a book text "Have a little fun" -- and I did, creating a funky little background for this image. This little card fits into an A2 envelope and the art measures 3.75" x 4.5". Large Fleurfly is colored with Prismacolor pencils. The background is patterned scrapbookpaper that I brayered with white acrylic. I smeared some more paint with my fingers, collaged a bit, and accent black acrylic with my liner brush. I have a box of nice quality A2 envelopes and I like making cards this size in advance. When I am looking for something to send, I peruse my collection and see what fits. Certainly the message "Have a little fun" would be a welcomed greeting. A little late on birthday greetings? 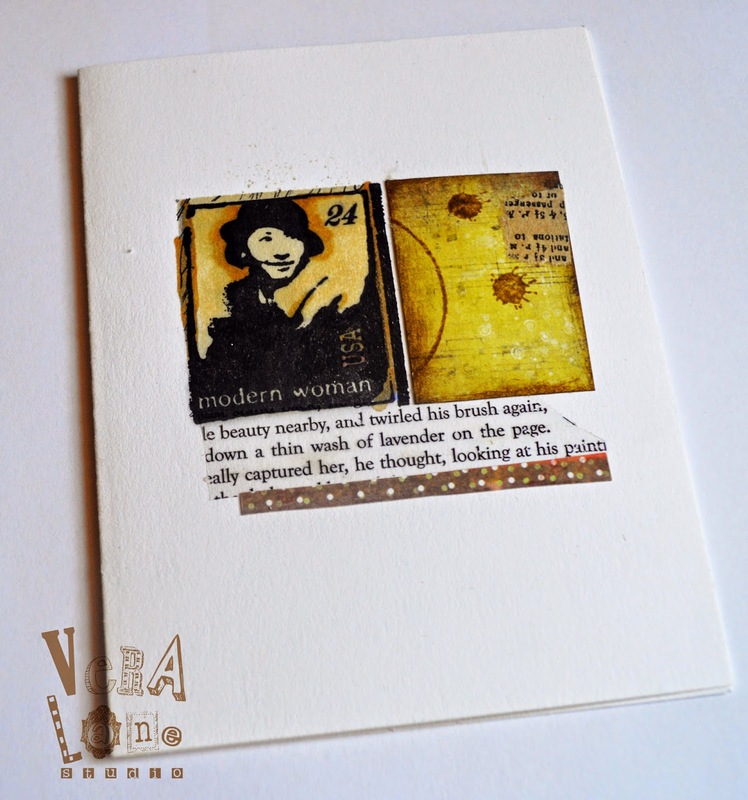 Why not use the Alice's Rabbit from Stampotique? This belated birthday card also uses splatter circle and 2 nuages. After the mess I made last week I have something clean and simple. As much as I love getting funky and messy, I am a huge fan of negative white space in a composition . I used post-it notes to mask off half of the modern woman image and stamped with black dye ink. I used Bic markers to color the image. A piece of scrap paper matched the colors chosen for an offset stamping of "splattered mug" with coffee Archival Ink. 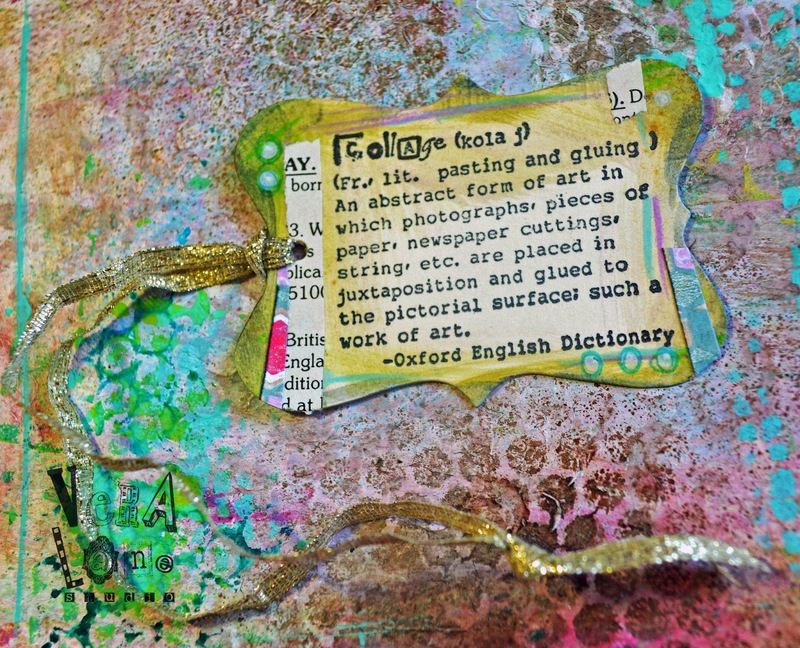 I used Tim Holtz Distress Ink in brushed corduroy around the edges of the paper scrap. I was pleased that gluing the cellophane wrapper (from flowers) with a UHU stick did the trick! For balance, I added a harmonious piece of scrap to anchor the composition. If you don't have and printed cellophane masking the area and stamping with a text block would do the trick. Stampotique has so many nice text stamps that would do the trick! The woman in the stamp is Leah Klein. I told her story in an earlier post using another stamp created in her image. Find the story here. Last week I had crazy fun with one of my little art students. 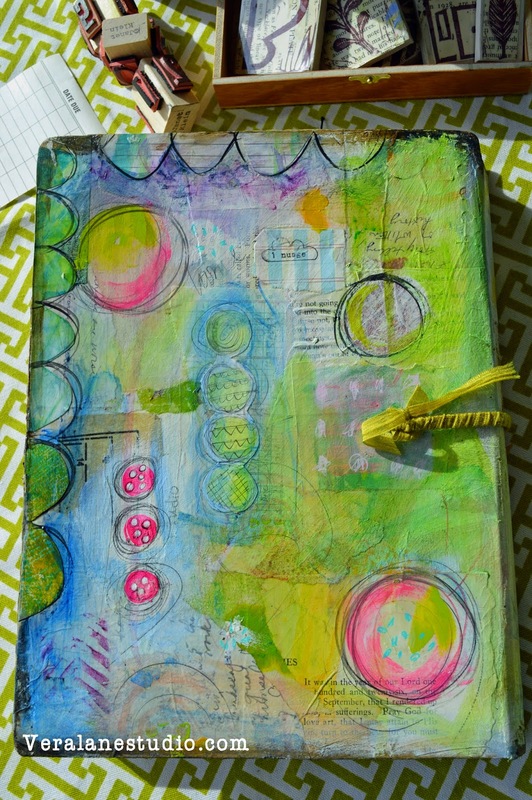 I gave her a choice of things to do and she chose to learn the Gelli Plate. We made so many papers and they are so fun to look at. I made some more when she left and found myself with yet another pile of fun papers. If you are like me you have boxes of your collage and printed papers that are put away. You really need to see what you have, right? When I used to teach elementary art I created collage boxes for the kids. They were wildly painted and Mod Podged with scraps. Real random, real fun. So I decided I needed to make one for myself. Then I thought, what a great gift idea for an arty friend! I immediately knew to grab my Collage Definition and made the hang tag. I brushed the edges of the tag with a damp brush and Inktense color blocks. Then I added some tiny scraps, doodled some and added a ribbon. The box was covered quickly with random layers. I even enhanced some papers with my Random Acts Alphabet. I stamped individual letters on the printed papers and cut some out for future projects. 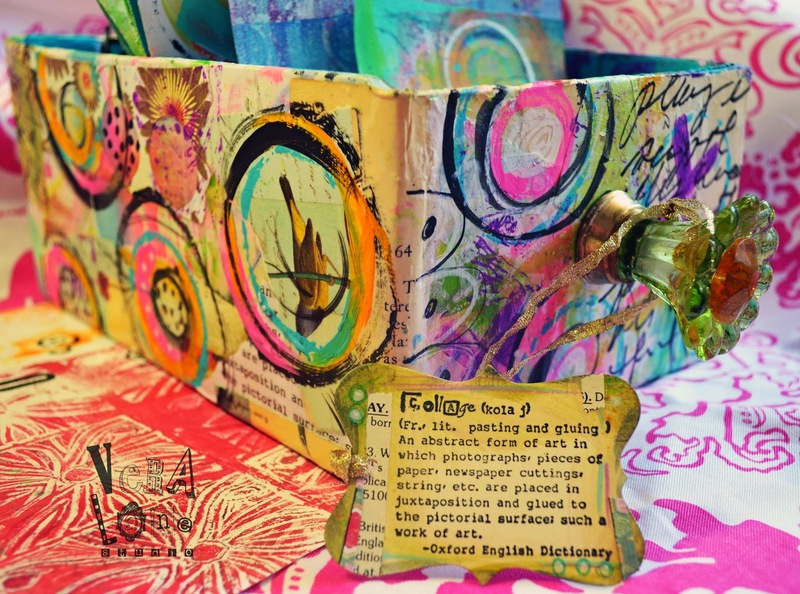 I'll know where to look for them in my funky collage box. After my box was dry, I added a decorative draw pull to the front of the box. What a fun gift! I'm so glad I made it. I'm gonna make more. And I think the little hang tag just tops it!